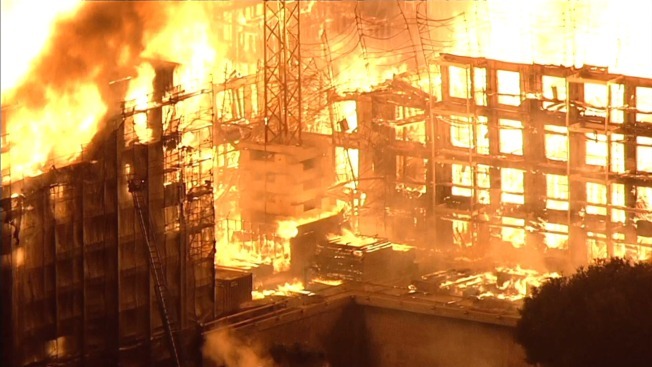 As other evacuees from the massive Oakland construction site fire were allowed to return to their homes and businesses Sunday, a new evacuation order was issued for a neighboring building. The cause of the fire remains under investigation. An ATF national team will be on hand Monday to help process evidence, officials said. Before the latest complication, only two buildings in the fire area had not been cleared for occupancy: 2343 Waverly and 2346 Valdez St., fire officials said. All gas and electricity had been restored to all other surrounding buildings, they said. The Red Cross opened an assistance processing facility at its offices at 3901 Broadway, officials said. Anyone directly affected by the fire should call the American Red Cross at (510) 595-4441 or visit them. Parking, foot and vehicle traffic in the vicinity of the fire will be affected because of the potential for falling debris and efforts to clear the area. Police are managing security in the area. Business owners whose businesses were affected by the fire are encouraged to call Oakland's Business Assistance Center at (510) 238-7952.